Given that it's pretty late at night and I'm so tired, I really wanted to go to sleep. 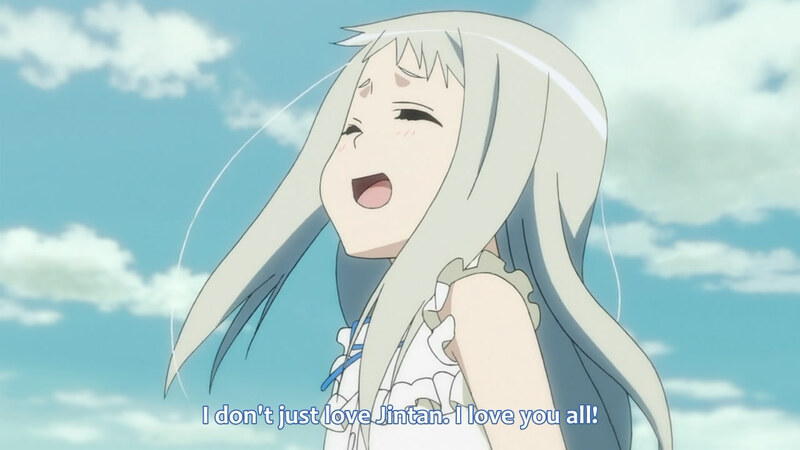 But I forced myself to watch AnoHana instead. ...it wasn't worth it. 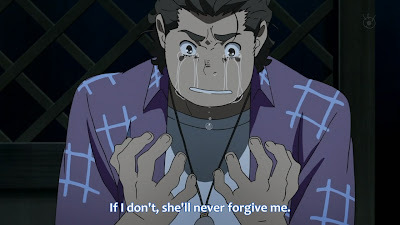 The last episode of AnoHana dragged on for so long that I had the irresistible urge to skip through it just to get to the end. 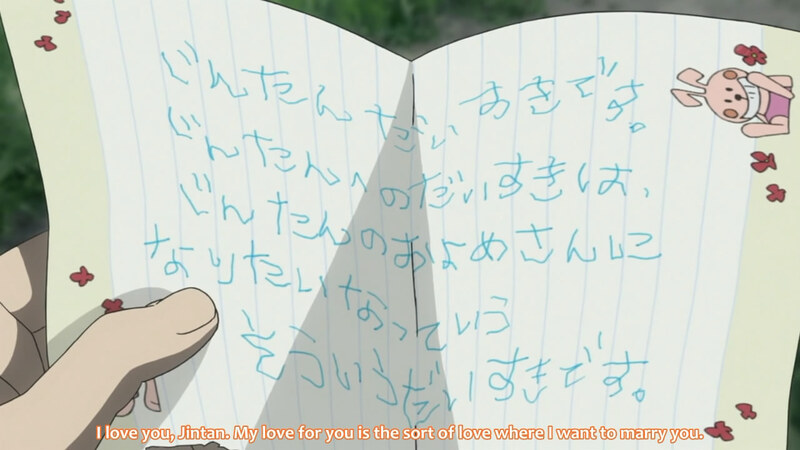 I stayed with this anime for two reasons: I have an uncontrollable urge to finish things and I wanted to know what Menma's wish was. After finding out pretty early on (though not early enough) what it was, I lost a lot of my willpower. Sadly, I continued onto the end and the forced emotions were quite forced. Wrapping up a story has never been so try-hard. Wasn't she going to learn to be okay with it? Or did I misread? We should all have such supreme controlling powers. I guess the crying session had an outcome - the friends got everything out into the open. I'd like to harp on the desecrating of Tsuruko's character once again, but I assume that it was expected after last time. I guess it could be said that she puts on a hard face so that her weak insides don't show, but there just wasn't enough character development for me to let that one go. So I'll just ignore it and realize that nice things don't last. While the friends became extremely selfish and blamed themselves for single-handedly keeping a spirit (that they can't even see) from going to Heaven, it eventually revealed some true events of their childhood. 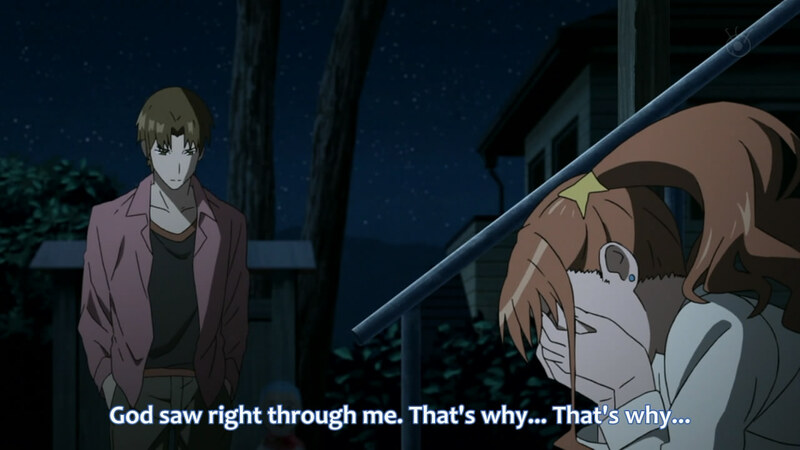 It turned out that Tsuruko was always more jealous of Anaru than Menma, because she knew she couldn't win against Menma (in Yukiatsu's eyes) but she couldn't understand how she wasn't even second-in-line (since Anaru seemed to understand Yukiatsu). Not having seen enough of their childhood, I took her words for face value. Even you, Poppo? So self-centred. 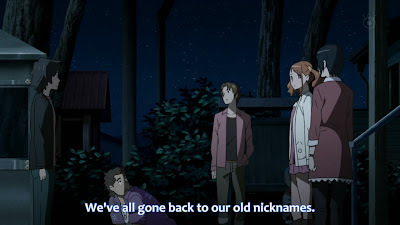 Poppo's scene was a little more poignant; I wondered during the last episode what his demons were and also hypothesized that it wouldn't be touched on. I was pleasantly surprised to be wrong - his demons are actually quite haunting. It turned out that he saw Menma die, in it that he saw where she ran off to and apparently saw her body getting farther and farther out. That's pretty chilling, and I wish he could have gotten some psychiatric help for that by the end (he didn't). 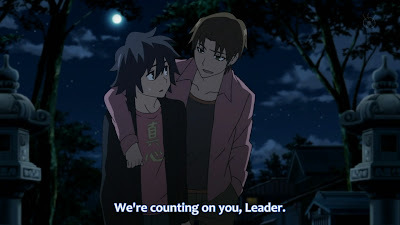 The friends made up "accidentally" in the middle of their joint crying ventures, in some very cliched ways, and vowed to truly help Menma this time. As if it shouldn't have been the first thing to do, they planned to talk to her properly through the diary to actually figure out what her wish was before beginning the planning phases. After I got over my flabbergasted state, I continued the video so that Jinta could run back to his house and find that Menma was already well on her way to disappearing. Why'd you have to come back 10 years later for this, anyway? As I had fully expected, Menma's wish was a promise made to Jinta's mother. It was far more wishy-washy than my assumption that it had to do with Jinta being alone; it was that Jinta needed to cry. 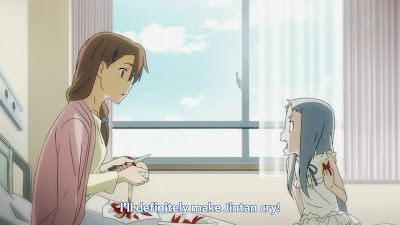 With a nice little bow, it was also revealed that the reason Menma wanted to meet up on the day of her death with everyone except Jinta was to determine how to make Jinta cry. Driving home her self-sacrificing nature, she also made the comment that perhaps her death was her punishment for keeping such secrets. I turned off pretty much around this point, so the remainder of the post may be a little strange and disjunct. The BL-lover in me giggled. I promptly stuffed her in a closet. With Jinta running back full-speed to the secret base (what makes it a secret, anyway? ), Menma "coincidentally" disappeared (from view, not existence; it couldn't possibly be that easy) the moment he walked through the doors. With him running around and yelling out for her without even acknowledging any of the other friends, it was a little comical to see how no one even kind of wondered if he really wasn't crazy. I would have. Anyway, it turned into a desperate search for her in the neighbouring woods (for scenic purposes, mostly) that no one really questioned. She even had the time to arrange them! Why wouldn't it end? 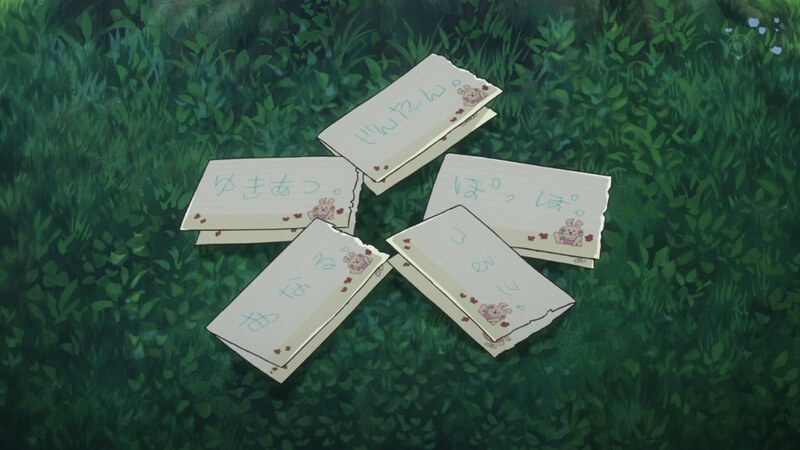 After some more crying about the notes, the group suddenly was able to see Menma standing in front of them. It wasn't really "sudden"; there was stuff about how a proper goodbye was needed or other such words, but they're of no importance. After everyone was able to see Menma, their hearts began healing and they told her just how much they loved her. 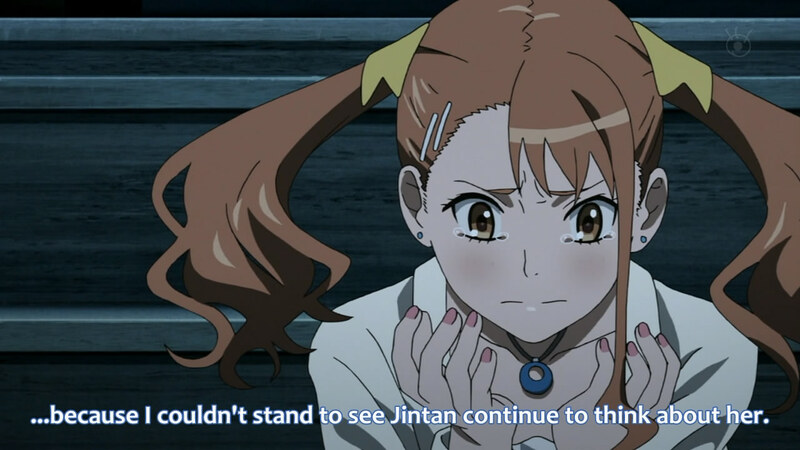 After Jinta's turn, of course, she disappeared. Finally. Did they forget the storyline where Anaru's friends weren't really her friends? The ending scenes, which was basically done with the OP playing in the background (whereas the ED played in the background just prior to that), showed how the friends were moving on (hopefully together, this time) after Menma's second death (that is what I have chosen to call it). 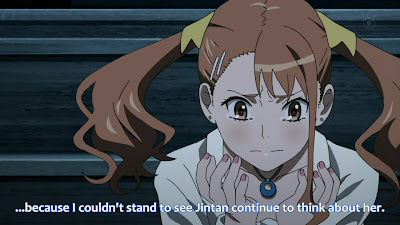 While there were no hints that Jinta and Anaru were getting together, it was obvious that, unless there's a sequel, there was probably some kind of sparking (even something based on just familiarity). Tsuruko and Yukiatsu were getting along a lot better, with him making an honest effort to reach out to her. I cared more than I thought I would but less than I would have if I still adored Tsuruko. Despite the strangeness of her character make-up, I still wish her happiness. I felt the worst for Poppo's character; he was all alone at the construction site working hard to study. Come on. Dammit. Alas, actions speak louder than words. 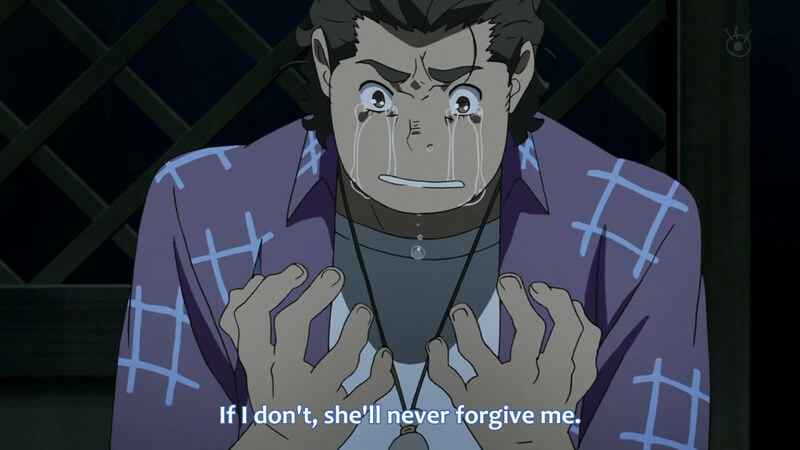 This episode was the hardest of this series to watch, by far. 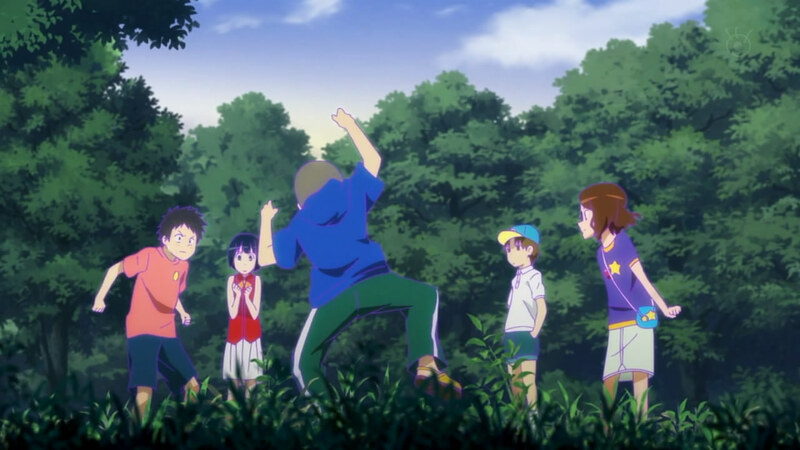 If the anime hadn't messed up so many times up until this point, I would have been a lot more interested to see it. It ended up exactly the way that it had been predicted, despite the twists and turns in the middle (which really deterred from the fact that it ended so expectedly). What can I really say about that? PS. Once again, a full review will come in a few days, after the bias wears off a little.